We are often asked for advice on what plants to use for screening. Screening can mean a low hedge, higher screening of buildings above a wall, or individual screening of telegraph poles etc. What shade will it throw? If it is planted reasonably tall will it need staking? What provision is there for watering? Is it to be formal or informal, evergreen or deciduous? 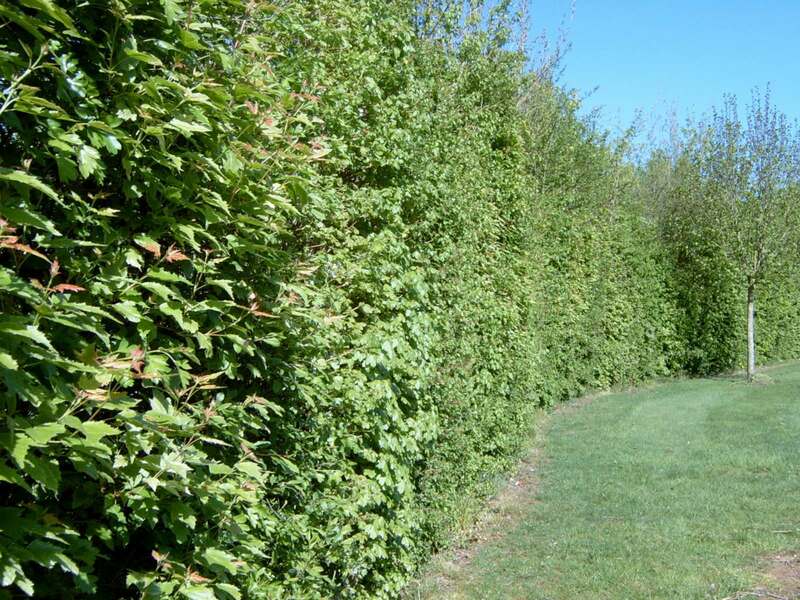 Hedges will offer a full screen generally up to 3 metres tall and there are various options. There are also many reasons to want a hedge apart from screening: as a wildlife haven; a backdrop to a border; a windbreak; a design feature; a noise reducer. If you can combine any of these reasons with your desire to screen then you have double the benefit. While you can of course go for a single species approach, typically a deciduous hedge will be a mixed native type. These plants make for great screening as they hold their winter leaves until the new growth starts in the spring.You therefore get the benefit of an evergreen hedge without looking at green all year round! Hornbeam will cope with the heavier clays in which beech will struggle. These hedges are suitable for a formal clipped appearance. Informal hedges tend more towards the ornamental, but still create effective screening and shelter.They can be planted with a variety of fruiting and flowering species, for instance Forsythia, Ribes, Hybrid shrub roses, Potentilla, Cotoneaster etc. One trim a year is sufficient for many of these species. Could the evergreen hedge be worked into a more interesting shrubbery mix rather than just the one species? Can you plant a border in front of the hedge? Could you break up the hedgeline with an ornamental tree or two? Can you achieve a ‘cloud’ effect rather than a wall effect? What structure will it create in your garden? Evergreen hedging plants to consider: Buxus, Cupressocyparis, Cotoneaster, Berberis, Ilex, Escallonia, Lavandula, Ligustrum, Prunus laurocerasus, Lonicera, Pyracantha. 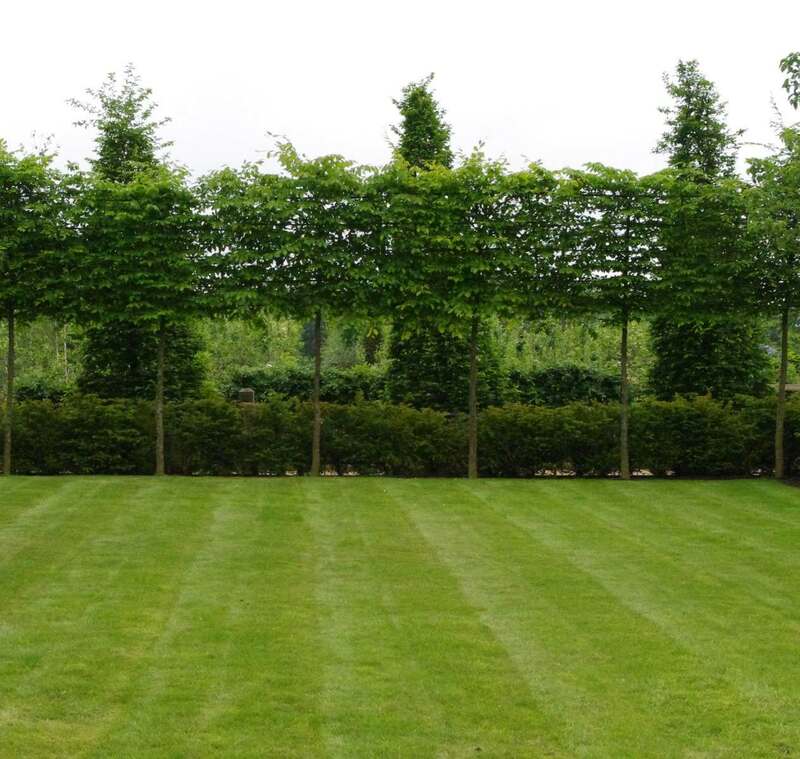 Stilted hedges – are hedges on stilts – the stem of the plant is generally clear of branches for 1.0-2.0m, above which the plants are pruned into a hedge.These are ideal for screens needed above a wall or similar and can be very effective – typical species to use are Hornbeam and Holm Oak (evergreen). Pleached trees – are trees that have been pruned and trained to be two-dimensional.They have a clear stem and are grown on a frame. Often over time a Pleached tree will form a stilted hedge if left to grow wide as well. The temptation when faced with a neighbour capable of overlooking your garden is to plant up a wall of green, which solves the immediate problem but leaves you with a whole new design headache. Some thought needs to go into breaking up the wall, bringing some of the planting forward, looking at scale, and thinking about the longer term, shade, underplanting etc. Cypress – There are many different varieties of Cypress, including Leylandii, which on its own is a great specimen tree. Pines – These are good and bushy as young trees, but bear in mind that some will lose lower branches as they mature (eg: Scots Pine). Photinia – A more ornamental species and available as a standard or shrub. Ilex – There are several different varieties of holly that make excellent screening plants, and are available in standard or shrub forms. Laurel – Ultimately can mature into a very large shrub, but can be pruned. Ligustrum – The archetypal Privet hedge, available as standard or shrub. Cedars – These are slow-growing and will needing generous space in years to come. Cotoneaster – Offers lots of visual interest in terms of leaves and berries, with many varieties to choose from. Also consider fastigiate trees which generally have a dense branch system creating good cover eg Hornbeam. Many of these trees as standards will come to you with a clear stem, great for subsequent underplanting. Some are feathered to the base and work well as stand alone specimens. Some work best if they are worked into a ‘shrubbery’ scheme which needs some planning as to final heights and subsequent management. Another wise tip is to discuss your plants with anybody who might be affected by them.